A reminder to all Minnesotans. April showers bring snow plowers! Our latest April snow storm has finally ended and the snow is going fast! The official tally at the MSP Airport from Wednesday to Friday was 9.8" and that makes it the 5th largest April snow storm in recorded history! Interestingly, the latest snow depth report at the MSP Airport on Saturday morning was only 3". With a high sun angle at this time of the year, the snow doesn't stick around long. In fact, most of this stuff should be gone by early next week! The official snow total at the MSP Airport was 9.8", which makes it the 5th largest April snow event at MSP on record! Note that in 2018, we had a record 15.8" during the April 13-16 blizzard! Interestingly, the snow from that storm melted in just 6 days! Sunday will be a much better and certainly much warmer than it was during the 2nd half of last week. Much of the state will warm into the 40s, which will still be nearly -5F to nearly -15F below average, but at least we're headed in the right direction! Weather models are hinting at another fairly potent storm system Wednesday - Friday of next week. 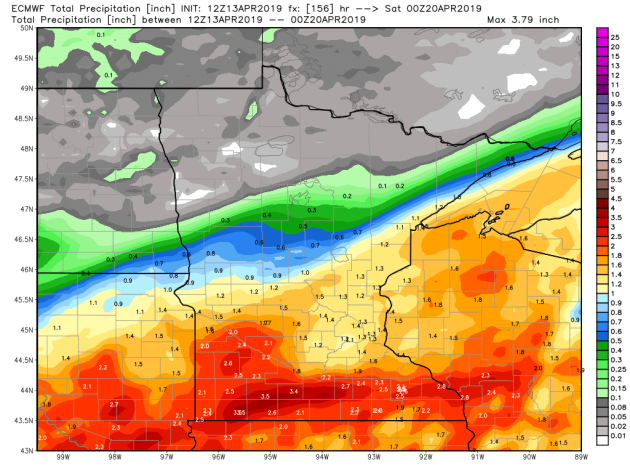 At this point, it look like it'll be mainly rain, but we can't rule out a little snow somewhere in the Upper Midwest. This storm looks like it could be another wind maker as well, so get ready for another messy week. Stay tuned. Here's a look at the ECMWF (European) and GFS (American) model outputs for total precipitation through the upcoming week. 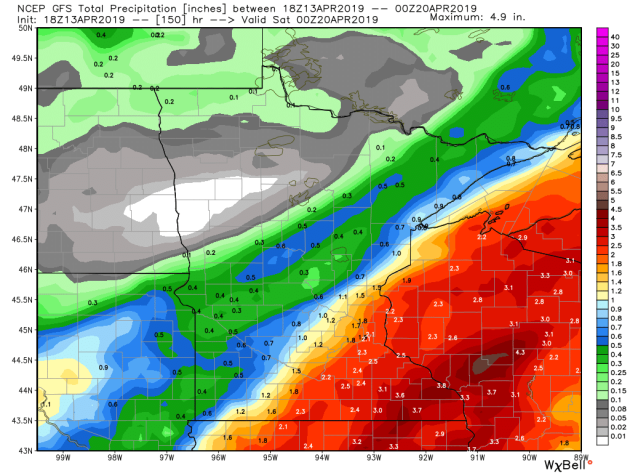 There's a chance that this next system could bring some fairly widespread 1" to nearly 2" liquid tallies across parts of the southern half of the state. If this verifies, we could be dealing some flood potential and river flooding scenarios once again. Stay tuned. AHH CHOO! Oh boy... Spring allergy sufferers are in rough shape right now as pollen levels pick up over the next few days. The worst looks to return Tuesday and Wednesday ahead of potentially steadier rains that could push in late Wednesday - Friday. According to NOAA's CPC, the temperature outlook from April 21st - 27th looks warmer than average across much of the western and southwestern part of the country. "Sometimes it snows in April. Sometimes I feel so bad, so bad. Sometimes I wish life was never ending. And all good things, they say, never last." Prince's lyrics ring true. 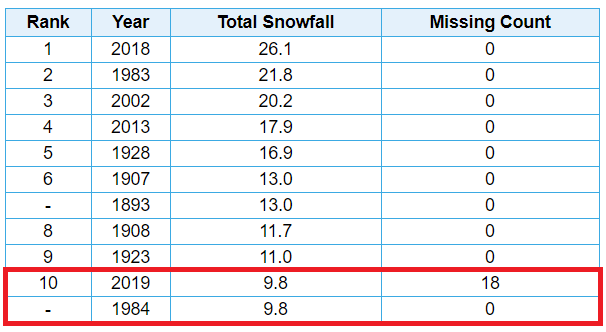 Here in the Masters of Meteorology, MSP just picked up a cool 9.8 inches of snow; the 5th largest April snow storm - the 10th snowiest April - and the 11th snowiest winter since 1872. Even my snow-loving buddies have thrown up their hands and said "enough already!" It's time for bikes, baseball, bugs and bass. And sun screen. Any day now. The sun lures the mercury into the 40s today, 50s Monday and 60F is possible Tuesday. Heavy showers and a few T-storms are likely Wednesday & Thursday as a storm tracks south. You'll be happy to hear the risk of snow on Thursday has diminished. 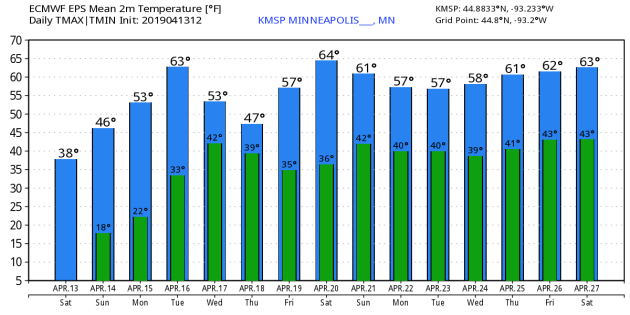 We should enjoy 60s next Saturday; the nicer day of the weekend. My wife keeps reminding me I don't know much, but here's what I suspect. 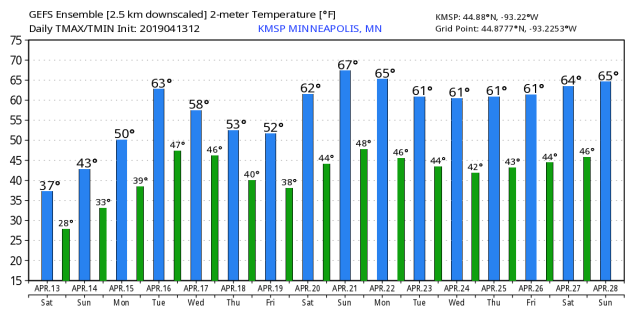 Lawns will green up in the next 10 days, daffodils will sprout, ice comes off the lakes and a lonely grill collecting dust on your deck will get some love! SUNDAY: Partly sunny and cool. Winds: NE 5-10. High: 47. SUNDAY NIGHT: Partly cloudy and quiet. Winds: NNE 5-10. Low: 34. MONDAY: Mostly cloudy with an isolated shower. Winds: SE 10-15. High: 52. TUESDAY: Sunny intervals, feels like spring. Winds: NE 5-10. Wake-up: 42. High:62. WEDNESDAY: Showers likely. Possible T-storms. Winds: E 10-20. Wake-up: 27. High: 62. THURSDAY: Heavier rain possible. Windy and raw. Winds: NE 10-20. Wake-up: 45. High: 47. FRIDAY: More clouds than sun. Dying breeze. Winds: N 10-15. Wake-up: 39. High: 54. SATURDAY: Partly sunny and pleasant. Winds: SW 10-15. Wake-up: 40. High: 64. 1983: A 'surprise' snowstorm covers east central Minnesota. The Twin Cities receives 13.6 inches, the all-time record for April. Brilliant blue skies and bright sun appear the next morning. 1886: The deadliest tornado in Minnesota's history rips through St. Cloud and Sauk Rapids, leaving 72 people dead. 80 percent of all buildings in Sauk Rapids would be leveled as the tornado's width expanded to 800 yards. As it crossed the Mississippi it knocked down two iron spans of a wagon bridge and local witnesses said the river was 'swept dry' during the tornado crossing. 300,000 dollars damage would occur in Sauk Rapids, only 4,000 dollars of which was insured. The forecast for that day was for local rains and slightly warmer with highs in the 50's. "No matter where you live, these next few mornings are a grand time to look for the elusive planet Mercury. For all of us, around the globe, Mercury is now below Venus – the brightest planet – in the sunrise direction, before daytime washes the pair from view. The morning of April 16, 2019 will present the closest pairing of Mercury and Venus in the morning sky for all of 2019. On that morning, these two worlds will be around 4 degrees (width of two fingers at an arm length) apart on the sky’s dome. They’ll be close enough together to fit (or nearly fit) inside a single binocular field. So if you see Venus, but not Mercury, in the sky before sunrise, try aiming binoculars at Venus to view both planets in a single binocular field. For the Southern Hemisphere, April 2019 showcases the Mercury’s best morning apparition for the year. The planet will be easily visible to the eye alone, below Venus before sunup. For the temperate and polar zones in the Northern Hemisphere, the view of Mercury in the morning sky isn’t as good. The planet is closer to the sunrise. Use binoculars to scan for it along the eastern horizon before sunup. Then remove the binoculars and try to see Mercury with the eye alone." 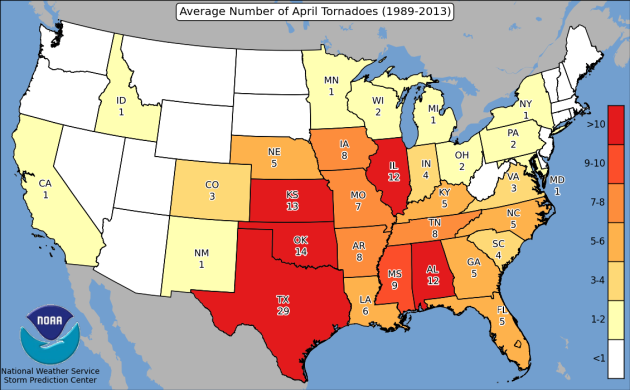 Here's a look at how many tornadoes there have been across the country so far this year. 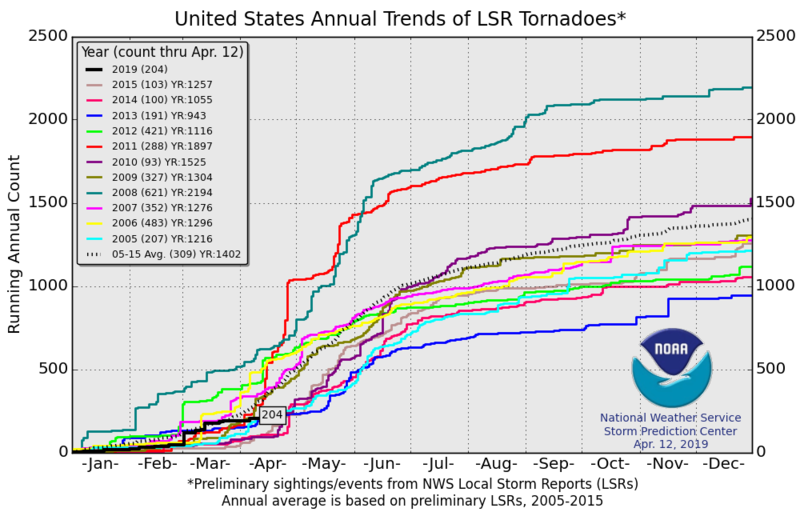 The preliminary count through April 12th suggests that there have been a total of 204, which is still below the 2005-2015 short term average of 309. According to NOAA's SPC, there is an ENHANCED risk of severe weather in orange, which means that there is a pretty good chance of severe storms. Damaging winds and a few tornadoes will be the primarty threat in this region, but there is a chance of strong to severe storms from southern New York to the Florida Panhandle. 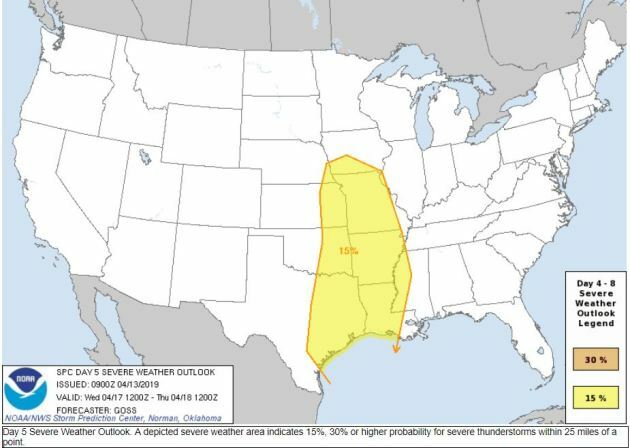 According to NOAA's SPC, there is already a highlighted risk for severe storms in the shaded yellow areas below. The SPC typically only issues extended severe weather risks this far in advance is severe weather is really a big threat. With that said, keep an eye on latest forecasts as we head into next week! Here's the weather outlook as we head through the rest of the weekend and into early next week, which shows a fairly potent storm wrapping up across the eastern half of the nation. Strong to severe storms will be possible in the Southeast along with locally heavy rainfall. Meanwhile, another strong Pacific storm will move into the Northwest, which will become another strong storm in the Central US as we head into next week. "Dust Devil rips roof off building in city park in Fairfield, Calif. while man twirls inside"
"FAIRFIELD, Calif. (KGO) -- Crews in the Solano County city of Fairfield are repairing the damage done by a powerful "dust devil" that ripped through a park on Tuesday. A surveillance camera captured the whirlwind as it formed in Alan Witt Park. The dust devil was so strong that it ripped part of the roof of a building, and sent debris flying everywhere. However, it did not seem to faze one man, who took the opportunity to stand in the middle of the mini-tornado, and twirl right along with it. Officials say the man, nor anyone else in the park was hurt. According to the American Meteorological Society, dust devils are small but vigorous whirlwinds, usually of short duration, but strong enough to cause minor damage. Diameters range from 10 to 100 feet, with an average height of 650 feet. Few have been observed as more than a half mile high." "U.S. forecaster sees 65 percent chance of weak El Niño in summer"
"There is a 65 percent chance of weak El Niño conditions continuing through the northern hemisphere summer this year, a U.S. government weather forecaster said on Thursday. “El Niño continued during March 2019, as above-average sea surface temperatures persisted across the equatorial Pacific Ocean,” the National Weather Service’s Climate Prediction Center (CPC) added in its monthly forecast. The CPC said chances of the weather pattern continuing through the fall season were slightly lower at 50 to 55 percent. Last month, the weather forecaster pegged the chances of weak El Niño conditions continuing through the northern hemisphere spring 2019 at 80 percent. El Niño can affect rainfall and temperature patterns in many regions, with important consequences for agricultural and food security sectors, according to the United Nations World Meteorological Organization." "How severe drought influences ozone pollution"
"From 2011 to 2015, California experienced its worst drought on record, with a parching combination of high temperatures and low precipitation. Drought conditions can have complicated effects on ozone air quality, so to better understand the process, researchers have analyzed data from two ozone-polluted cities before, during and after the California drought. They report their results in ACS' journal Environmental Science & Technology. Although ozone in the stratosphere protects the earth from ultraviolet radiation, at ground level the molecule is a harmful air pollutant to humans, animals and plants. 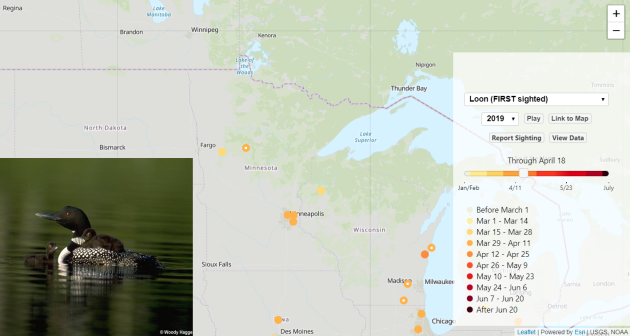 Ground-level ozone forms when nitrogen oxide compounds, primarily from motor vehicle emissions, react with volatile organic compounds (VOCs) from natural and anthropomorphic sources. Isoprene, a VOC emitted by plants, is a significant contributor to ozone production during summer months in many locations around the world. However, plants also decrease air ozone levels by taking the gas up through pores in their leaves. Because drought conditions affect both of these plant-related processes, Angelique Demetillo, Sally Pusede and colleagues wanted to examine air concentrations of isoprene and ozone—as well as leaf area index, nitrogen dioxide and meteorology—before, during and after the California drought." "Two thirds of ice in the Alps will melt by 2100 due to climate change, scientists warn"
"Emissions rising at their current rates will result in almost all of the glaciers in the Alps melting by the end of the century. A recent study has found that half of the ice in the 4,000 Alpine mountain glaciers will have disappeared by 2050 due to a combination of rising temperatures and past pollution. Even if carbon emissions dropped all the way to zero by 2050, researchers still think it would be too late to save the glaciers and estimate that two-thirds of the ice will still have melted by 2100. Losing the glaciers would negatively impact nature, farming, hydroelectricity and tourism in the area. 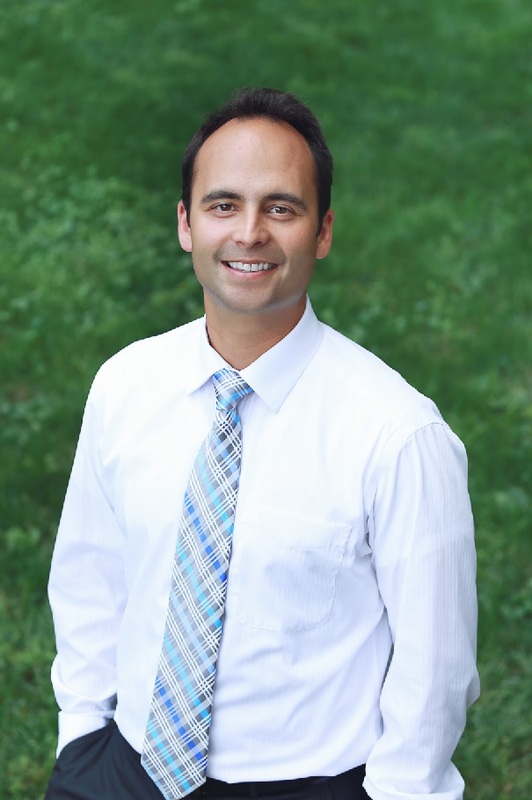 Glaciologist Daniel Farinotti was part of the team who conducted the research. He said: "Glaciers in the European Alps and their recent evolution are some of the clearest indicators of the ongoing changes in climate." "Storm chaser captures rare upside-down lightning"
"Rare upside-down lightning has been captured in slow-motion footage by a storm chaser. Freak weather in Texas produced the backward lightning flashes, which lasted about half a second in real time but can be seen clearly in the video. Veteran photographer Dan Robinson observed the backward bolts lighting up the sky. Robinson has been traveling to document events like this for the past 26 years and heads into storms on a regular basis to capture this kind of footage. Lightning that travels upward is normally triggered by an initial lightning bolt coming down from the clouds. This initial bolt results in an electrical field change, which causes upward lightning to be triggered from a ground-based object like a building or cell tower."